The spring-driven, eight day movement of this capucine consists of going, striking and alarm trains. 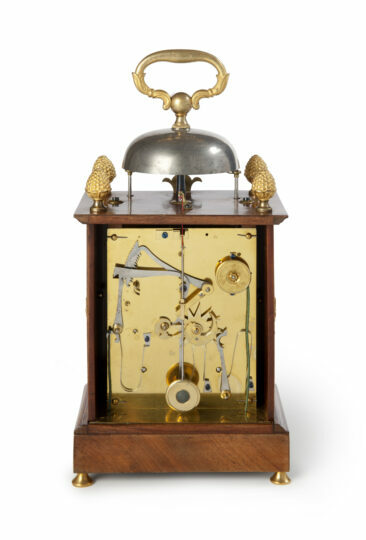 The going train has anchor escapement and a short silk-suspended pendulum, the regulation of which is situated on top of the case. 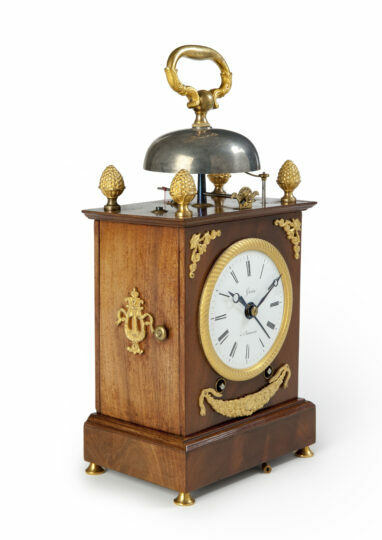 The rack striking train indicates the hours fully and the half hour with a single stroke on a bell. Two minutes past the hour it is repeated. In addition the clock has trip repeat, activated by pulling a chord. The alarm is also activated by pulling another chord, which winds a spring. 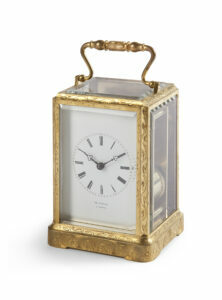 The white enamel dial has Roman hour, five-minute and minute divisions. The time is indicated by a pair of blued-steel Breguet hands. The alarm train is set by a straight blued-steel sweep central pointer on the chapter ring. 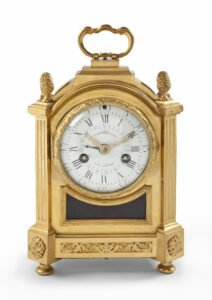 The maker has signed the dial in the middle Gorin à Beauvais. The dial is set in an engine-turned bezel. 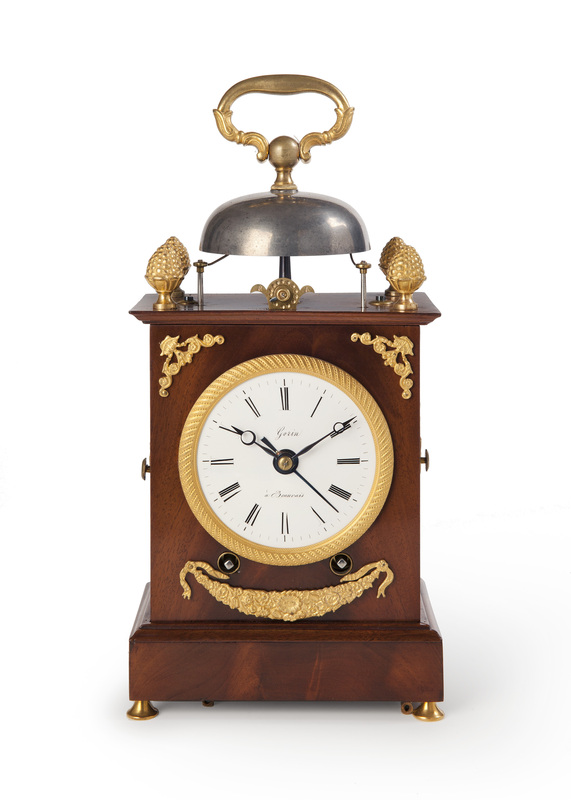 The mahogany case of this capucine is embellished by ormolu ornaments. There are doors to the sides and the back, the latter having a catch. 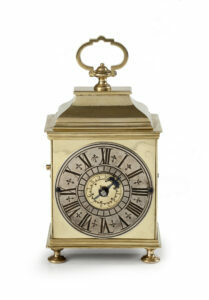 Beneath the dial is a gilt-brass swag, whilst there are symmetrical ornaments in the top corners. The case is surmounted by a bell, which has a shaped carrying handle on top. 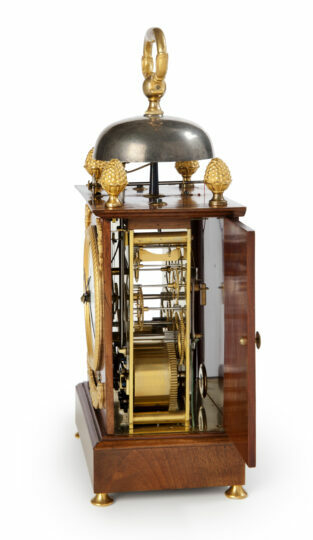 The top corners of the case are adorned by four ormolu pineapple finials, whilst the clock rests on four cone-shaped gilt-brass feet.